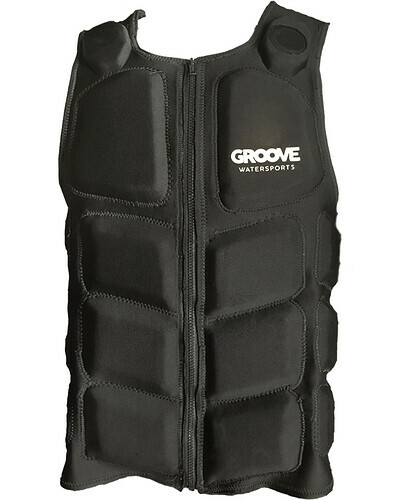 What do you guys think of Groove Watersports and this Groove Vest that they are coming out with. It is an impact vest with two speakers in the shoulder area to play music while you ride. It can play music for up to 10 hours on one charge and has built in memory so you don’t need your phone. I think it would be great to have while out on the water and have access to my music. Groove Watersports & The Groove Vest. (US Patent NO 9,894,943 B2). Impact Vest with Speakers. Listen to your music while wakeboarding. The Groove Vest is the first competition style wakeboard vests with speakers. I was thinking of such idea but not like that… jetsurf is too noisy to hear the music without headfones unless you want to become a bumbox and put it too loud, it will look weird on the beach. however with headfones i could not find any that may fit the helmet. P.S. The quality on the foto looks terrible, i think the sewing will fall apart after a few uses. The waterproof mp3 player costs 16 eur on amazon.